Guess who got their påskris on this weekend? As a kid, the best part about easter was creating the ornaments for påskris (not the feathers, you buy them, but painted eggs, paper roosters, pipe cleaner witches, crochet catkins, yarn ball chickens and all of that). I had to load up this tree. I’m still not 100% on what a crochet catkin looks like, but y’all, I will have it on next year’s tree. Paper roosters too. 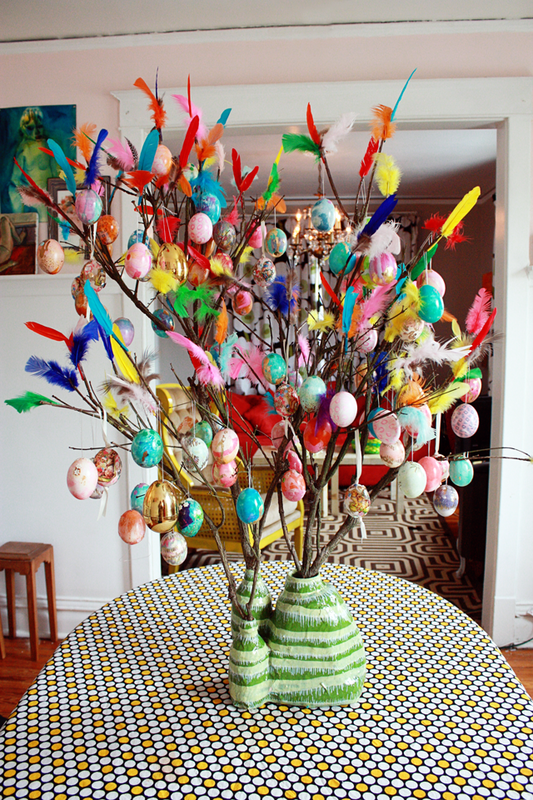 For now we will have to stick with egg ornaments — this much I can handle on the fly. You always do the best fun holiday crafts–this one is a work of art! LOVE! p.s. make sure to enter my $100 shopbop contest! Lawzey Peaches! This looks incredible! I sincerely thank you for adding the eggs. What a visual feast! This is such an exuberant little tree. It looks like it could dance. Just wait until it grows up. I bet it will look just like this one. A catkin is a cattail that grows in the marsh. It looks like a small brown hotdog. You work on those, and I’ll work on the pipe cleaner witches. Very impressive! Do you like natural feathers, or the really bright ones? You could have all your readers send in a feather for next year. That feathery bit of niceness is simply charming! Makes me smile just to see it! Happy Easter and God Bless! I just wrote about hotdogs growing on trees! (my dad)…. now I *need* to make some catkins. I NEED TO! You know, I bought a pack of natural brownish turkey/guinea fowl type feathers on my home specifically to temper the rainbow feathers I had at home, but when I opened the bag they were in very bad shape. Not cleaned properly. Still stuck together at the tips –gross. Smelled bad too. On the upside, Lola went crazy for the two I let her play with. She enjoys the hunt! What about pipe cleaner witches?!?! I like this idea of collecting from people –that would be a sight to see! Best Easter post I have ever seen, no doubt. I cannot believe you came over to comment on my Star Wars Eggs and didn’t tell me about this absolutely awesome ridiculousness over here! This påskris is incredible – I want one so badly now and I didn’t know what it was moments ago! So glad to find your blog. I agree 1000% with Michele regarding the paskris—could I possibly make one in the 40 hours remaining before Easter? hmmm. Anyhoo, I stumbled over to your blog from AT and can’t believe how awesome it is! I will be back for more soon and plan on stalking you on Pinterest. Happy Easter to you! Where did you get the colored feathers and the eggs from? 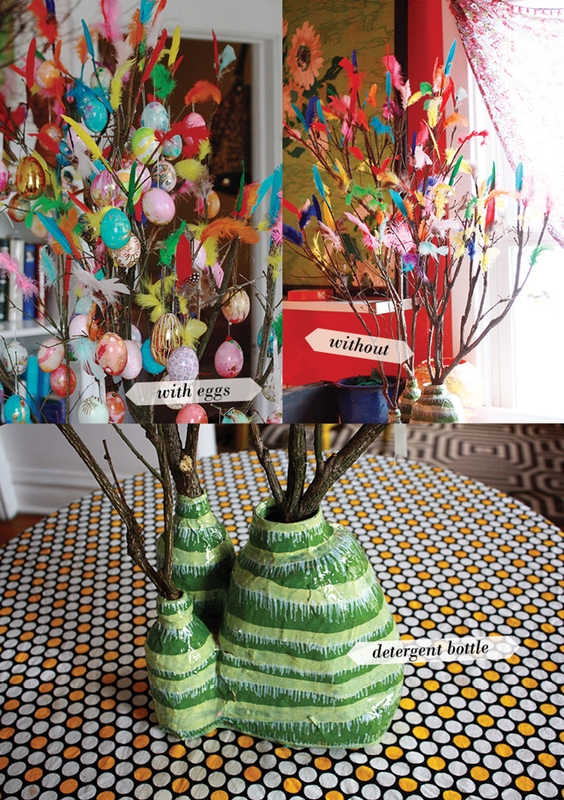 There are tutorials for the colored eggs all around my site here – the feathers can be purchased at any craft or hobby store, usually a whole pack is a couple of dollars. Good luck!